Dogs, cats, bears, raccoons, weasels, mongooses, hyenas, seals, walruses, etc. Classification after Wozencraft 2005 and McKenna & Bell 1997. Arnason, U., K. Bodin, A. Gullberg, C. Ledje, and S. Mouchaty. 1995. A molecular view of pinniped relationships with particular emphasis on the true seals. Journal of Molecular Evolution 40:78-85. Arnason, U., A. Gullberg, A. Janke, and M. Kullberg. 2007. Mitogenomic analyses of caniform relationships. Molecular Phylogenetics and Evolution 45 (3): 863-874. Barycka, E., 2007. Evolution and systematics of the feliform Carnivora. Mammalian Biology 72(5):257-282. Bininda-Emonds, O. R. P., J. L. Gittleman, and A. Purvis. 1999. Building large trees by combining phylogenetic information: a complete phylogeny of the extant Carnivora (Mammalia). Biological Reviews of the Cambridge Philosophical Society 74:143-175. Dalerum, F. 2007. Phylogenetic reconstruction of carnivore social organizations. Journal of Zoology 273 (1):90-97. Delisle, I. and C. Strobeck. 2005. A phylogeny of the Caniformia (order Carnivora) based on 12 complete protein-coding mitochondrial genes. Molecular Phylogenetics and Evolution 37(1):192-201. Dragoo, J.W. and R. L. Honeycutt. 1997. Systematics of mustelid-like carnivores. Journal of Mammalogy 78:426-443. Flynn, J. J., J. A. Finarelli, S. Zehr, J. Hsu, and M. A. Nedbal. 2005. Molecular phylogeny of the Carnivora (Mammalia): Assessing the impact of increased sampling on resolving enigmatic relationships. Systematic Biology 54(2):317-337. Flynn, J. J. and M. A. Nedbal. 1998. Phylogeny of the Carnivora (Mammalia): Congruence vs. incompatibility among multiple data sets. Molecular Phylogenetics and Evolution 9:414-426. Fulton, T. L. and C. Strobeck. 2006. Molecular phylogeny of the Arctoidea (Carnivora): Effect of missing data on supertree and supermatrix analyses of multiple gene data sets. Molecular Phylogenetics and Evolution 41(1):165-181. Gaubert, P., W. Wozencraft, P. Cordeiro-Estrela, and G. Veron. 2005. Mosaics of Convergences and Noise in Morphological Phylogenies: What's in a Viverrid-Like Carnivoran?. Systematic Biology 54(6):865-894. Gittleman, J. L., ed. 1989. Carnivore Behavior, Ecology, and Evolution. Cornell University Press, Ithaca. Hunt, R. M. Jr. and R. H. Tedford. 1993. Phylogenetic relationships within aeluroid Carnivora and implications of their temporal and geographic distribution. Pages 53-73 in Mammal Phylogeny. Volume 2. Placentals. (F. S. Szalay, M. J. Novacek, and M. C. McKenna, eds.) Springer Verlag, New York. Ledje, C. and U. Arnason. 1996. Phylogenetic analyses of complete cytochrome b genes of the order carnivora with particular emphasis on the Caniformia. Journal of Molecular Evolution 42:135-144. Ledje, C. and U. Arnason. 1996. Phylogenetic relationships within caniform carnivores based on analyses of the mitochondrial 12S rRNA gene. Journal of Molecular Evolution 43:641-649. Lento, G. M., R. E. Hickson, G. K. Chambers, and D. Penny. 1995. Use of spectral-analysis to test hypotheses on the origin of pinnipeds. Molecular Biology and Evolution 12:28-52. Nojima, T. 1990. A morphological consideration of the relationships of pinnipeds to other carnivorans based on the bony tentorium and bony falx. Marine Mammal Science 6:54-74. Nowak, R.M. 1999. Walker's Mammals of the World. Sixth Edition. Volume I. Johns Hopkins University Press, Baltimore. Ridgway, S. H. and R. Harrison (eds.) 1981. Handbook of Marine Mammals. Volume 1. The Walrus, Sea Lions, Fur Seals and Sea Otter. Academic Press, San Diego. Schreiber, A., K. Eulenberger, and K. Bauer. 1998. Immunogenetic evidence for the phylogenetic sister group relationship of dogs and bears (Mammalia, Carnivora : Canidae and Ursidae) - A comparative determinant analysis of carnivoran albumin, C3 complement and immunoglobulin mu-chain. Experimental and Clinical Immunogenetics 15:154-170. Slattery, J. P. and S. J. O'Brien. 1995. Molecular phylogeny of the red panda (Ailurus fulgens). Journal of Heredity 86:413-422. Van Valkenburgh, B. 1999. Major patterns in the history of carnivorous mammals. Annual Review of Earth and Planetary Sciences 27:463-493. Veron, G. 1995. The phylogenetic position of Cryptoprocta ferox (Carnivora). Cladistic analysis of the morphological characters of modern and fossil Aeluroidea Carnivora. Mammalia 59:551-582. Wang, X. M. 1997. New cranial material of Simocyon from China, and its implications for phylogenetic relationship to the red panda (Ailurus). Journal Of Vertebrate Paleontology 17:184-198. Wolsan, M. 1999. Oldest mephitine cranium and its implications for the origin of skunks. Acta Palaeontologica Polonica 44:223-230. Wolsan, M. and B. LangeBadre. 1996. An arctomorph carnivoran skull from the Phosphorites du Quercy and the origin of procyonids. Acta Palaeontologica Polonica 41:277-298. Wozencraft, W. 2005. Order Carnivora. Pages 532-628 in Mammal Species of the World: A Taxonomic and Geographic Reference. 3rd ed. D. E. Wilson and D. M. Reeder, eds. Johns Hopkins University Press, Baltimore. Wyss, A. R. and J. J. Flynn. 1993. A phylogenetic analysis and definition of the Carnivora. Pages 32-52 in Mammal Phylogeny. Volume 2. Placentals. (F. S. Szalay, M. J. Novacek, and M. C. McKenna, eds.) Springer Verlag, New York. Yu, L., Q. W. Li, O. A. Ryder, and Y. P. Zhang. 2004. Phylogenetic relationships within mammalian order Carnivora indicated by sequences of two nuclear DNA genes. Molecular Phylogenetics and Evolution 33(3):694-705. Zhang, Y. P. and O. A. Ryder. 1993. Mitochondrial-DNA sequence evolution in the Arctoidea. Proceedings of the National Academy of Sciences (USA) 90:9557-9561. Introduction to the Carnivora. UCMP Berkeley. Order Carnivora. Animal Diversity Web. University of Michigan Museum of Zoology. Carnivores. The Living Africa: Wildlife. ThinkQuest library. References on Mustelids and Viverrids. Compiled by Thierry Lodé, Université d'Angers. Bear Cats. WildLife on Easy Street, Inc.
Civets. WildLife on Easy Street, Inc. The Brown Hyaenas of the Cape Flats. South African Museum. Canid Specialist Group. IUCN - The World Conservation Union. Species Survival Commission. Dog Genome Project. A collaborative study involving scientists at the University of California, Berkeley, the University of Oregon, and the Fred Hutchinson Cancer Research Center. Project Vulpes. Information about Foxes. Bears of the World. National Wildlife Federation. International Association for Bear Research and Management (IBA). Panda Central. Zoological Society of San Diego. Conservation de la Loutre d'Europe. The European Polecat Mustela putorius. Conservation Plan for the European mink. The World Wide Raccoon Web. Coatimundi. WildLife on Easy Street, Inc. The Pinnipeds: Seals, Sea Lions, and Walruses. Marine Mammal Center. National Marine Mammal Laboratory (NMML). Canada's Marine Mammals. Part of the Canada's Aquatic Environments web site. University of Guelph. Pinniped Photo Gallery. National Marine Mammal Laboratory. 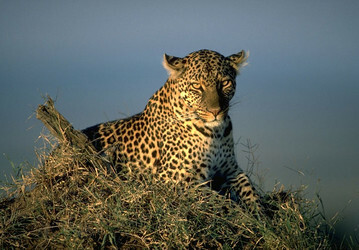 With the setting sun in her eyes, an adult female leopard waits at the base of a small tree in the Masai Mara of Kenya, while her cubs feed on an impala carcass she carried to a branch overhead. Page: Tree of Life Carnivora. Dogs, cats, bears, raccoons, weasels, mongooses, hyenas, seals, walruses, etc.. The TEXT of this page is licensed under the Creative Commons Attribution-NonCommercial License - Version 3.0. Note that images and other media featured on this page are each governed by their own license, and they may or may not be available for reuse. Click on an image or a media link to access the media data window, which provides the relevant licensing information. For the general terms and conditions of ToL material reuse and redistribution, please see the Tree of Life Copyright Policies.